NHKA Racing Series drivers take a lot of pride in their kart prep and respect for safety. All day long you’ll notice fellow racers looking over your kart for loose or missing parts. Don’t feel judged, it means they like you enough to save you from a DNF or worse. Our one-on-one safety tech sets NHKA apart. These days most clubs give you a self-tech form which they use to cover THEIR backs. NHKA covers YOUR back by giving you Paul Bowin. As NHKA’s pre-race safety inspector, and a veteran racer, he’s there to help make sure your kart is as safe as possible and meets our requirements. 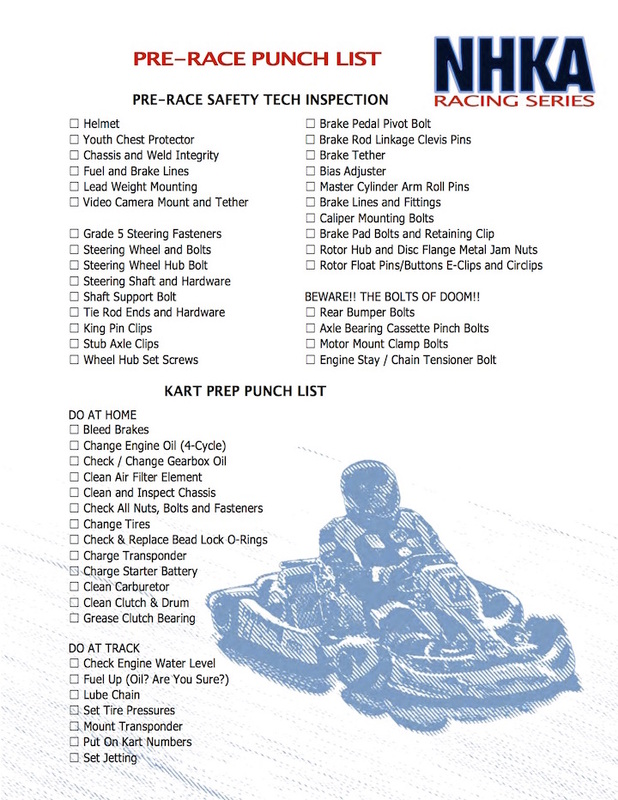 The above checklist and details below will give you a solid idea of what Paul will be looking for to approve your kart to hit the track. HELMET: Must be full faced and designed for kart, motorcycle or open-wheel car racing. Extra brownie points for having the lining pushed aside for Paul to check the SFI or Snell rating and expiration. YOUTH CHEST PROTECTOR: Required for drivers under 12 years old, and should be brought to pre-race tech. SAFETY APPAREL: Not required for inspection unless requested. Full-body, abrasion-resistant racing suit and gloves, neck collars and high-top driving shoes are required. Throughout the day officials will be watching for unstrapped helmets and neck collars, exposed skin or loose hair and clothing. While proper use of safety gear is the responsibility of the driver or their guardian, officials will black flag anyone they see whose equipment isn’t as it should be. These are two totally separate inspections covering completely different things. Pre-race tech is all about safety. Post-race tech is all about ensuring the rules are followed. Passing pre-race tech in no way means your kart is legal for your class, only that it meets our safety requirements. CHASSIS: Tubing, welds and floor pan should be free of cracks. FUEL LINES: Must be only as long as needed, routed and secured to prevent wear or rupture, and safety wired or zip tied at all connection points. LEAD WEIGHTS: Must be painted white and secured with a 5/16″ min. diameter bolt and double nutted, as well as cotter pinned and/or safety wired. Weights more than 7lbs must have two bolts. VIDEO CAMERAS: Helmet mounting is NOT allowed. Action cams must be mounted and tethered to the kart for pre-race inspection. CHAIN GUARD: Required because chains break fairly often, and holy cow, those things are moving plenty fast when they do! STARTER BATTERY: Must be reliably secured to the kart.